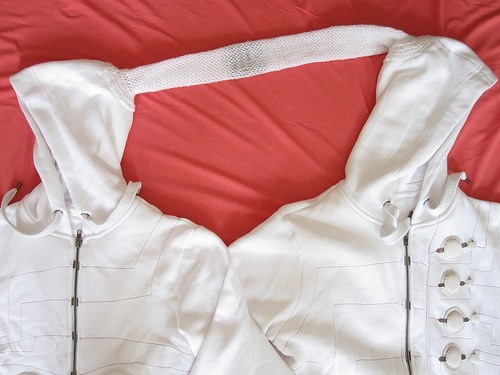 Incredibly bizarre, Mika Satomi and Clemens Pichler have designed a pair of DJ hoodies to theatrically visualize a DJ battle. Unfortunately, for me at least, Human Centipede is evoked (damn, I shouldn't have seen that movie). "DJ Hoodie is a wearable interface that includes 4 channel zipper switch, fabric buttons with LED indicators and fabric pressure sensors. Two of these hoodies are connected with knitted stretch sensors on the hoods. It interfaces with computer with arduino using Firmata library and Pduino." For the HowTo curious, check out their project documentation.